When identifying Emerging Market and Emerging Technology opportunities, Medtronic mission directs our growth in biomedical engineering where we grow our knowledge through education and immersive learning and partner with people and facilities to allow Medtronic to make the greatest impact of worthy contributions. That's why, Medtronic Innovation Center (MIC) in Turkey was established in 2014 to engage and identify the unmet needs in Turkey and Emerging Markets, generate ideas for local regional tailored products or solutions, explore opportunities to find partners for long term collaboration within local ecosystem, and scouting local technologies to expand the size of the R&D footprint since we believe Local R&D accelerates innovation and its impact on Emerging Markets. In this presentation, the speaker will introduce MIC, its capabilities of training the healthcare professionals, Local R&D, its importance and R&D activities at innovation center. 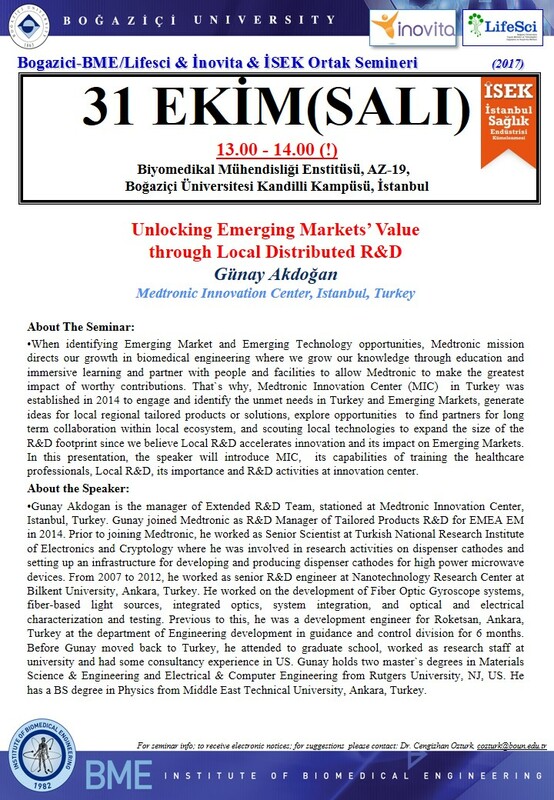 Gunay Akdogan is the manager of Extended R&D Team, stationed at Medtronic Innovation Center, Istanbul, Turkey. Gunay joined Medtronic as R&D Manager of Tailored Products R&D for EMEA EM in 2014. Prior to joining Medtronic, he worked as Senior Scientist at Turkish National Research Institute of Electronics and Cryptology where he was involved in research activities on dispenser cathodes and setting up an infrastructure for developing and producing dispenser cathodes for high power microwave devices. From 2007 to 2012, he worked as senior R&D engineer at Nanotechnology Research Center at Bilkent University, Ankara, Turkey. He worked on the development of Fiber Optic Gyroscope systems, fiber-based light sources, integrated optics, system integration, and optical and electrical characterization and testing. Previous to this, he was a development engineer for Roketsan, Ankara, Turkey at the department of Engineering development in guidance and control division for 6 months. Before Gunay moved back to Turkey, he attended to graduate school, worked as research staff at university and had some consultancy experience in US. Gunay holds two master's degrees in Materials Science & Engineering and Electrical & Computer Engineering from Rutgers University, NJ, US. He has a BS degree in Physics from Middle East Technical University, Ankara, Turkey.